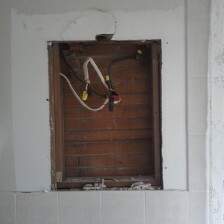 Here it is: The Big Reveal of the Bathroom Remodel. Ahhhh, white and flowerless. Much better. Now for the big question. How did I do on my $1000 budget? $999 <------ Can you believe that?!?! Still not bad at all considering what it would have cost me to have someone do it. Plus it took at least 30 years off that bathroom. Now if the Kitchen will only work out so well. How did the reglazing hold up? Was it different to clean with it done? Compared to a whole new tile job, it was DEFINITELY worth the price!